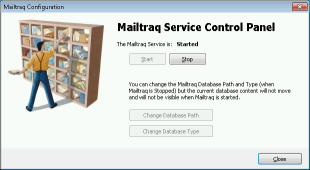 Mailtraq runs as a Windows Service, and is normally automatically run at machine start-up. 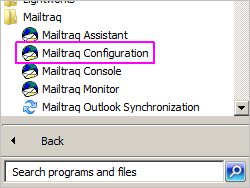 The 'Mailtraq Configuration' option in the Windows Start Menu gives access to the Mailtraq Service Control Panel. This application enables you to stop and start Mailtraq on demand. Access the 'Mailtraq Configuration' application from the main Windows 'All Programs'. The main Management functions of Mailtraq are accessed from the Console Options, Actions and Tools menus. The Server Tab, which appears in the Server Properties dialog, is used to enter the Mailtraq's domain name and its aliases. This is the primary name of the Mailtraq Server and it will be used whenever Mailtraq generates a return address or a full address for a local mailslot. Mail addressed to any of the domains or machine host names in this list box will be delivered to a local mailbox. If mail forwarding is used all the alternative address forms should be included here. If mail is to be received to an IP address all possible variations should also be included. Email addresses are formed from a user name and the domain name (separated by an @ symbol). So: If a message addressed to one of these is received, Mailtraq attempts to deliver it to a local mailslot. Otherwise, the message is placed in the Outbox and delivered to another mail server. Enter the name which Mailtraq should use to identify itself when sending administrative messages. This defaults to the Mailtraq server identification name with "Mail Server" appended. If inbound mail appears immediately in the Outbox, check first that domain names and machine host names are entered correctly on this tab.